A horror movie that involves the collaboration of Stephen King, Tobe Hooper and Robert Englund sounds like a great idea on paper, right? Right! 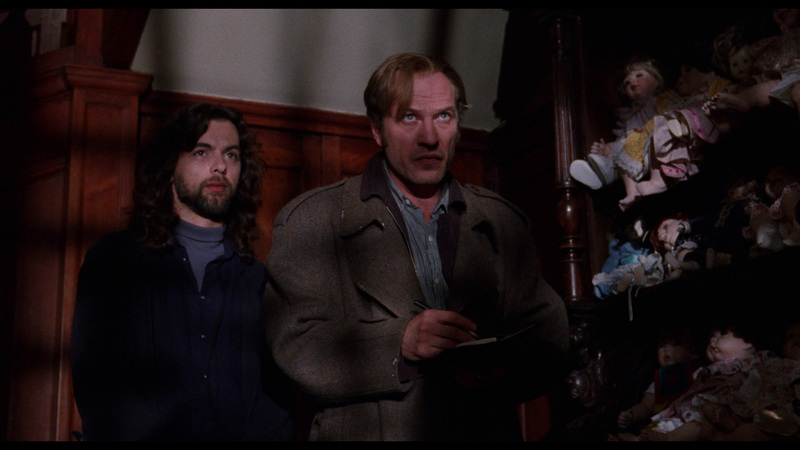 But then… The Mangler, Hooper’s 1995 adaptation of King’s short story starring Englund in the lead was released to pretty much universal disdain. Is it as bad as its reputation would have you believe? Sort of, but not entirely. It is, at the very least, worth revisiting – how often do you get to watch a movie about a possessed laundry folding machine? Bill Gartley (Englund) owns a laundromat called The Blue Ribbon Laundry Company that rest above a massive underground labyrinth and that hosts an old steam press/folding machine. 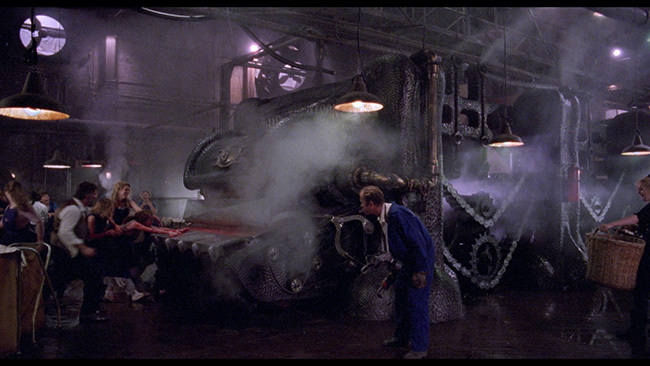 This machine has the strange habit of occasionally pulling workers into its mechanical belly and squishing them dead. After this happens a few times, local cop John Hunton (Ted Levine of Silence Of The Lambs) decides to investigate. 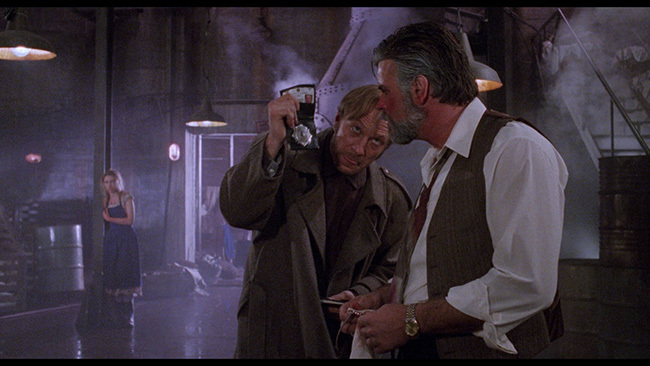 Never mind the fact that Gartley’s surviving staff hangs around after the murders. Realism isn’t something that was meant to be a part of this movie, apparently. Anyway, yeah, Hunton, with some help from his occult expert brother-in-law Mark Jackson (Daniel Matmor), tries to figure out just what’s going on here. As he starts poking around, he learns the sordid history of the machine – a virgin was once cut on it and since then it’s somehow become possessed. Gartley is also more than he seems, not just an old man with some disfigurement (though he is that too), he’s hoping to trap his unwitting niece into becoming the machine’s next victim, a human sacrifice that will unleash its potential for pure evil! Adapted by Hooper, Stephen Brooks and Peter Welbeck, this story has… problems. Quite a few of them. First off, there’s the pacing. 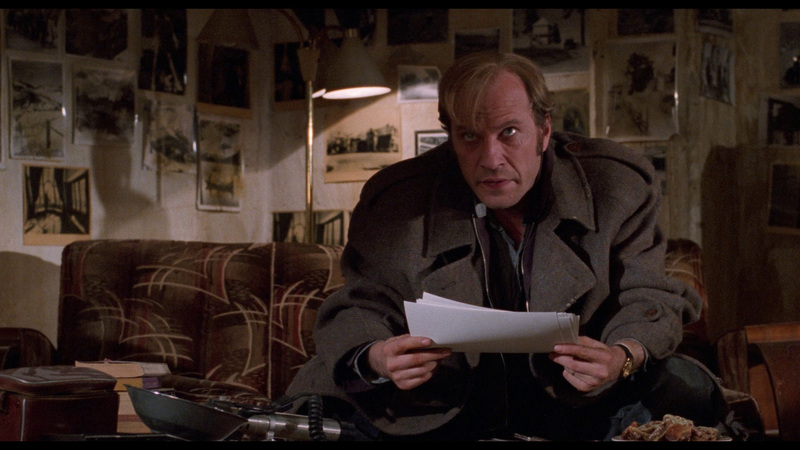 There are long stretches where nothing of interest actually happens in this movie. After that, there’s the whole concept of a possessed laundry machine, proving that what works on paper where our imagination does all the work for us doesn’t always translate so well to the screen. 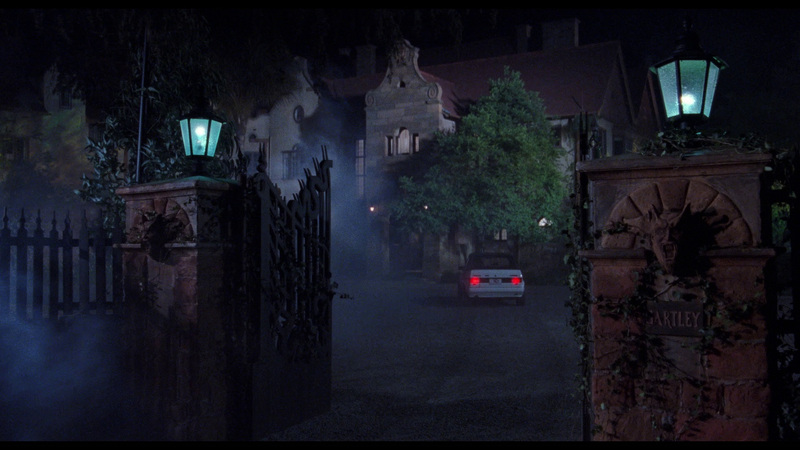 Third, there’s the look of the film, which bounces back and forth with no rhyme or reason between realism and over the top gothic something or other. The underground labyrinth, for example, has this interesting look to it, but it’s never really used for anything except as a staging ground for the film’s ridiculous finale. Ridiculous is probably the best word to describe the film, really. 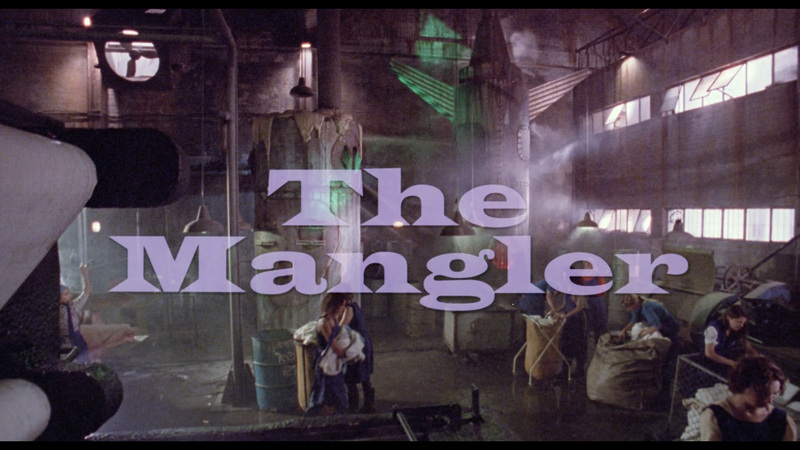 The positive side of that is that The Mangler is ridiculous enough to at least prove entertaining. The leads are at least amusing. 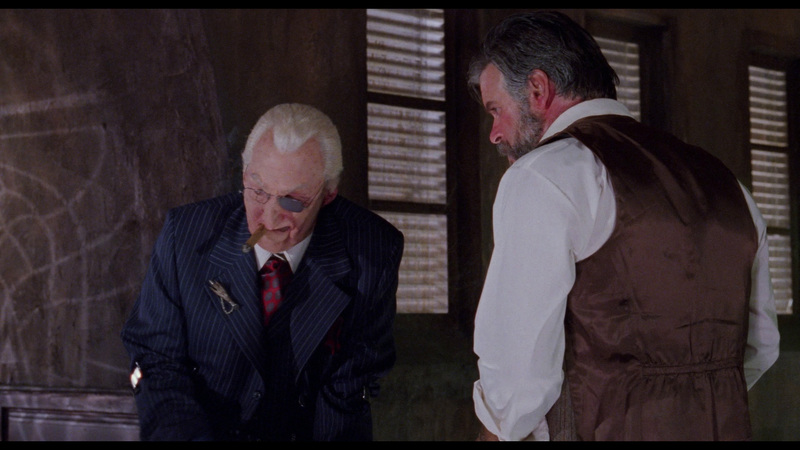 Englund seems to be channeling Peter Sellers in Dr. Strangelove while Levine is basically playing a cop version of the serial killer he played in Silence Of The Lambs, speaking in the same style and using similar body language – it’s a genuinely weird performance. The movie features some pretty strong gore effects, there’s a fair bit of splatter here, and they’re done well. 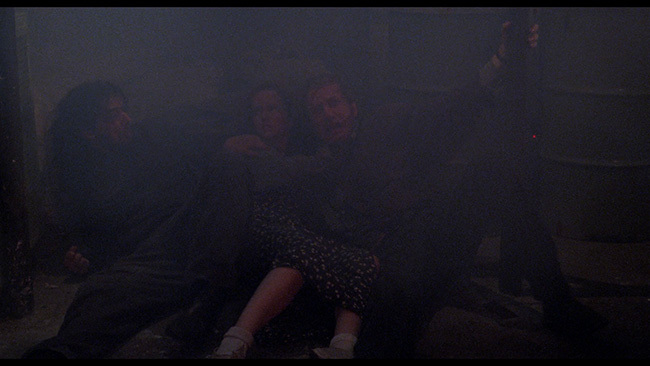 The effects team earned their paycheck on this one, some of the murder set pieces do impress. 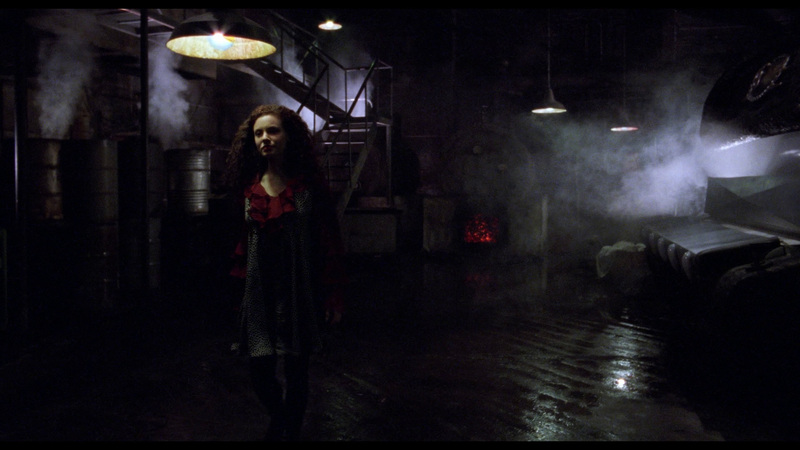 Cinematography from Amnon Salomon (who also shot Hooper’s Night Terrors) is solid. 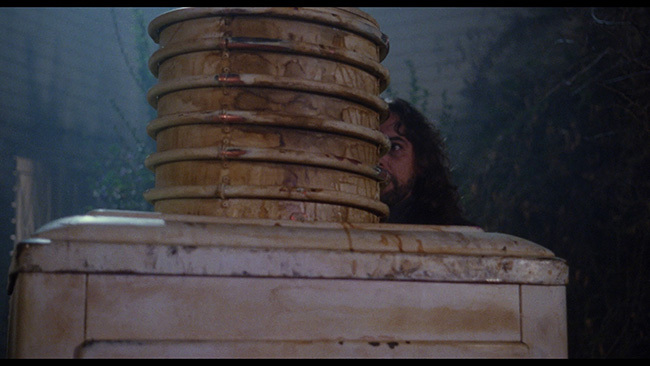 There’s nice camerawork here, capturing the goofiness with enough artistry to at least ensure the movie looks good. Barrington Pheloung’s score is okay. You might not rush out and buy the soundtrack when the movie is over but it serves its purpose. 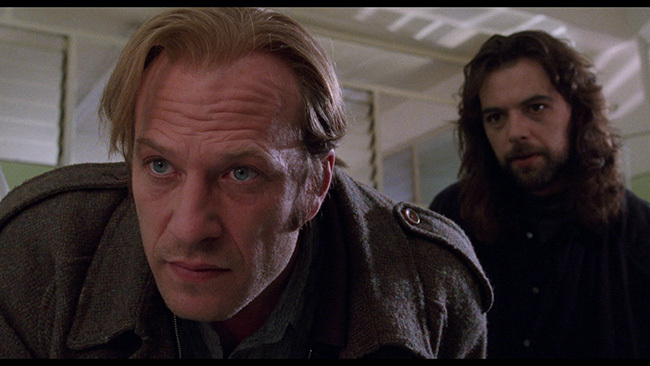 But the whole thing is silly, uneven in its pacing and direction and hard to take seriously. That said, if you don’t need to take it seriously, you should at least be entertained by it all. Shout! 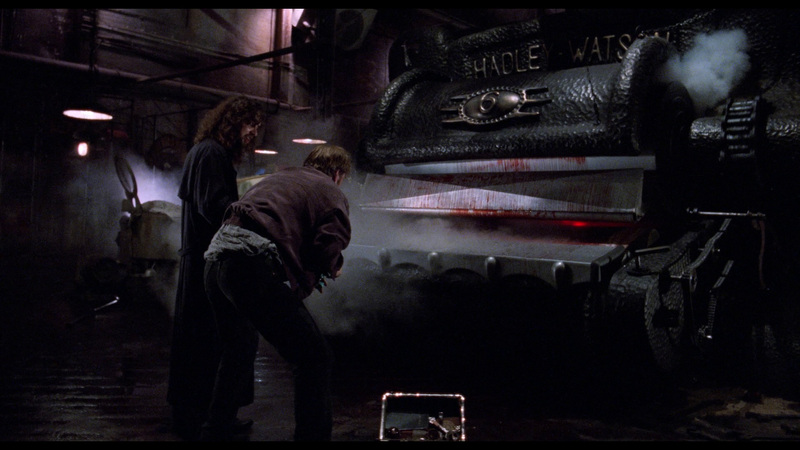 Factory debuts The Mangler on Blu-ray with a new 4K scan of the original camera negative of the uncut version of the film, presented in AVC encoded 1080p high definition and framed at 1.85.1 widescreen on a 50GB disc. It’s a nice-looking transfer. Detail is strong throughout and colors look great. Black levels are also pretty solid and we get nice depth, detail and texture. Skin tones look fine, the image is film-like, showing some expected film grain but no problematic print damage to discuss. Compression artifacts are a non-issue and the transfer is free of any obvious noise reduction or edge enhancement issues. Audio options for the feature are provided English language DTS-HD 5.1 and 2.0 Master Audio options with subtitles provided in English only. The 5.1 track is solid enough but there are a few spots where some of the dialogue does sound a little buried in the mix. Aside from that, there’s decent directionality for the score and effects throughout the mix, with the front and rear channels used well int this regard. Bass response isn’t particularly bombastic but it’s there. There are no audible problems with any hiss or distortion. The main extra on the disc an exclusive audio commentary with co-writer Stephen David Brooks who speaks about adapting King’s short story for the film, Hooper’s direction, how he came to work on this project in the first place, his thoughts on the end product and more. Shout! Factory also provides Hell’s Bells – An Interview With Actor Robert Englund, a featurette that runs just shy of twenty-three-minutes in length. This is quite interesting, Englund is always an entertaining interviewee, and he speaks quite fondly of the film, holding a higher opinion of it than most. 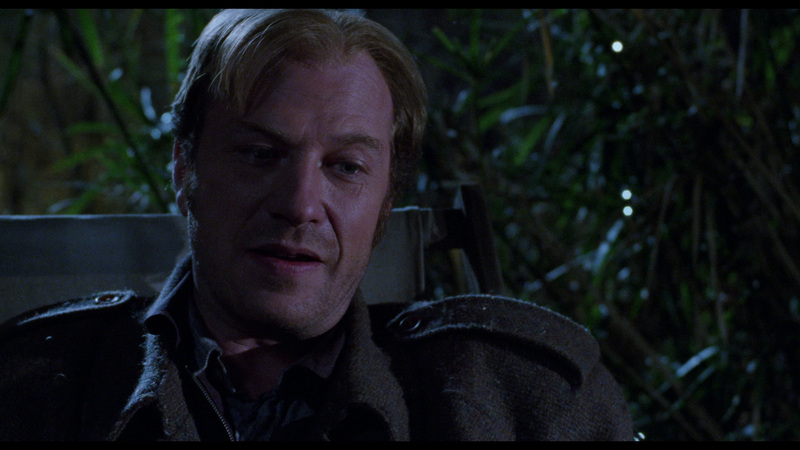 He talks about landing the part, working with Tobe Hooper and his thoughts on his character and the film itself. Rounding out the extras is twelve-minutes of ‘Rare Behind-The-Scenes Footage’ showing the cast and crew at work with some commentary from Hooper, the film’s original theatrical trailer, a TV spot, menus and chapter selection. 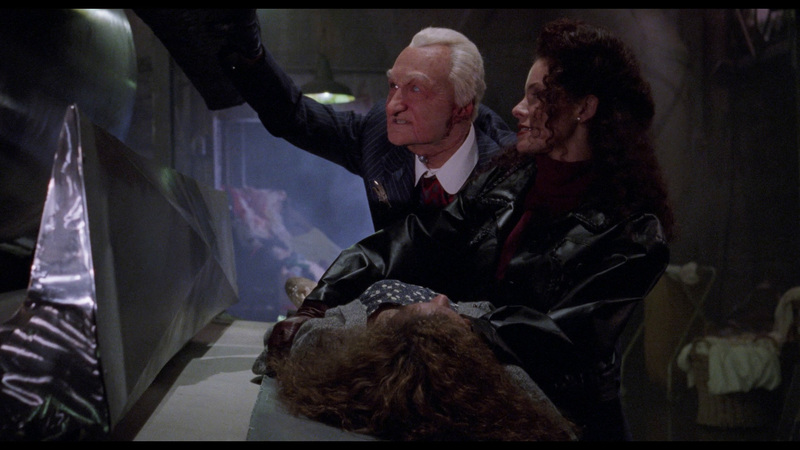 The Mangler isn’t likely to ever be regarded as a horror classic, but there’s entertainment value to be had here if you’re in the right mood for it – and it doesn’t hurt if you’re a big Robert Englund fan. Shout! Factory brings the film to Blu-ray in a more than respectable presentation. It looks really good, it sounds just fine and, surprisingly, it’s got a few decent extra features as well. All in all, a fine presentation for an enjoyably goofy film. Click on the images below for full sized The Mangler Blu-ray screen caps!